Kindle loves this project because... through publications, on-the-ground movement building, education and leadership the Other Worlds team inspires us to challenge our notions of activism. They inspire us to re-imagine how gender, environment, and natural disaster can continue to be addressed with ferocious creativity and commitment. Defining our community as social movements, the greatest challenge they articulate is growing control by transnational capital over everything, from the marketing of air (through carbon trading) to governments. Its members, who give everything they have with courage, commitment, and faith in the belief that, if united, we can change the world. I could name enough to fill libraries, so I will use my two sentences to speak of just one close friend and real-life hero: Berta Cáceres, a Lenca leader of the land reform, indigenous rights, and democracy movements in Honduras. For her troubles, Berta’s life is currently precariously on the line, and she is living underground. Back story: I was on the staff of President Aristide of Haiti during and after the three years of a hellish US-backed coup d’état. Most fulfilled: After unquantifiable deaths and suffering, global and Haitian political pressure succeeded in reversing that coup and restoring democracy. I most deplore the violence that continually meets movement activists. An untold number of my dear friends and colleagues have been arrested and tortured, some assassinated. The idea that profound transformation is possible is not a pipe dream. We know that large-scale poverty and inequity are the result of policy choices, and therefore we know that different choices can yield different outcomes. The exact same thing I’m doing now. I couldn’t do anything else. If I weren’t doing this work, I’d be too depressed about the state of the world to keep on living. My favorite moment at work is when we learn of, or get to be part of, a victory in which the odds that everything might be lost are reversed. We see repeatedly that people who have almost no resources or power can create such victories with unity, persistence, and good strategy. Of the many, one is Dennis Brutus, a close friend and extraordinary anti-Apartheid and global justice leader from South Africa. His body is dead, but his spirit and message live on powerfully. My favorite historical figure will surely not be known by anyone reading this, but it is Father Antoine Adrien, a Haitian liberation theology priest and spiritual and political leader, now deceased. He took me under his wing from the time I was 21, served as my primary mentor, and continues to guide my work every day. I shared crab bisque – being in New Orleans – with my darling 88-year old mother. If you could give $10,000 to any organization besides your own, which would it be and why?It would be to the Council of Indigenous and Popular Organizations (COPINH) of Honduras, run by the aforementioned Berta Cáceres. In a country with the greatest violence of any in the entire world except those at war, COPINH burns like a flame of hope for justice for indigenous peoples, campesinos, and women. To my mind, the greatest social issue of our time is the interconnected and skyrocketing level of poverty, inequality, hunger, and landlessness. The root cause is the same in each case: unequal distribution of wealth, resources, and power. The greatest environmental issue of our time is climate change, which is another issue fostered by the desire of profit and power. As with other problems, it is a crisis for which solutions can be found. The Insufferable Gaucho by Roberto Bolaño. My siblings, who send me videos and photos of my 17 beloved nieces and nephews. They rock my world with hilarity and delight. We are only limited by the size of our vision. Beverly Bell is the coordinator of Other Worlds and Associate Fellow at the Institute for Policy Studies. She has worked for more than three decades as an organizer, advocate, and writer in collaboration with social movements in Latin America, the Caribbean, Africa, and the U.S. 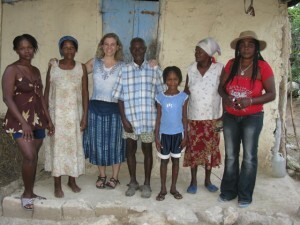 Her brand-new books are Fault Lines: Views across Haiti’s Divide (Cornell University Press) and Harvesting Justice: Transforming Food, Land, and Agriculture Systems in the Americas (Other Worlds, co-authored with Tory Field). It is urgent that the Kindle community joins us in calling on the Honduran government and US officials to respect the rights of indigenous Lenca people and demilitarize Rio Blanco, where COPINH (referenced in Bev’s interview) have for two and a half months blocked the construction of an illegal hydroelectric dam on their territory.